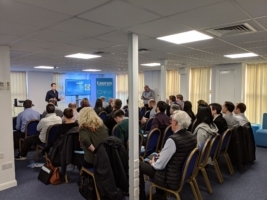 A networking event for local businesses which presented the ever changing landscape of Cloud services, and how businesses could utilise these to increase efficiency in the work place. A record number of attendees were greeted with high quality artisan coffees and a plethora of freshly baked pastries provided by Exe Coffee Roasters, the room was packed and the atmosphere buzzing! Ollie Jackman, Field Sales Manager of Taurus started proceedings before passing over to Ian Rowan, UK Channel Manager at Wildix presenting “Communication via the Cloud, Should it be Limited to Voice?”. Richard Whybra, Technical Director at Taurus discussed the Cloud and defining what it is, and what could happen in the not so distant future. After a refreshment break Rob Loakes, UK Channel Manager at Wildix, discussed the history of Wildix and provided a Full Live Demonstration of the Wildix Solution, and how it seamlessly could integrate and improve business efficiency. Thank you to everyone who attended and thank you to the Wildix team for all you help creating this highly successful event. Please keep an eye out for the next event, dates to be released shortly!